Maria Riccetto was eleven when she realized that she wanted to become a professional dancer. 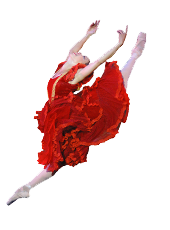 Since age eight she had been taking daily class at the National Ballet School in her native Montevideo, Uruguay. It is a rigorous school; admission is by audition, and in Maria’s year only twenty-seven out of one thousand two hundred were accepted. Students study academic subjects in the morning and ballet in the afternoon, in addition to training in music and character dance. When she was eighteen, she was spotted by Gyula Pandi, a teacher at the North Carolina School for the Arts who brought her to NCSA, gave her a scholarship, taught her English, and helped arrange for her to live with faculty member Gina Vidal. She knew she had been given a wonderful opportunity, but was terribly homesick nonetheless; she even slept with her return ticket home under her pillow. She spent only one year at NCSA but in that short time was able to study with former NYCB Principal, the legendary Melissa Hayden, and also with Fanchon Cordell, Nina Danilova, Frank Smith, and Warren Conover. In spring of 2000, Pandi took her to New York, where she took class with ABT’s Studio Company. The next day she was invited to take class with the senior company and was offered a contract right after class. She opted to remain in North Carolina to finish work with Hayden on performances of Balanchine’s Symphony Concertante before joining ABT in the Fall. Soon she found herself in a tremendously diverse and demanding repertoire:Swan Lake, Le Corsaire, Romeo and Juliet, La Bayadere, The Nutcracker, works by Balanchine, Morris, and Tharp. She has already danced soloist roles in Don Quixote and Sleeping Beauty. She was chosen for the original casts of new ballets by Kirk Peterson and Robert Hill and was given what she rightly calls an “amazing opportunity:” a lead role in Onegin, the part of Olga. It has become Maria’s favorite role, one to which she can bring her impressive dramatic talents, and one which has earned her critical acclaim. She describes Olga as romantic and flirty, but ultimately tragic. Maria has had the chance to work with Natalia Makarova, (whom she describes as demanding, specific, and inspiring), on Soloist roles in La Bayadere. She has also enjoyed the challenge of Balanchine for her roles inSymphony in C, Symphony Concertante, and Theme and Variations. Maria’s outgoing personality has served her well in adjusting to living so far away from her close-knit and supportive family. She took the initiative in meeting the other dancers, arriving at the studio early so she could get to know people and now has many new friends at ABT. She enjoys New York, likes going to movies and shows, and – unusual for a ballet dancer but typical for the daughter of a cattle rancher – she likes to ride horses. Maria discovered Gaynor Minden at NCSA where other dancers there “had good things to say about them.” She likes Gaynor Minden’s stability both en pointe and working flat as when, for example, she does La Bayadere and has to do some forty unsupported arabesques penche in a row without a single wobble. She says they fit “like a slipper” and are very good for Balanchine: responsive, flexible, and very quiet. She danced Onegin with a fresh pair every time but never needed to break them in: “just sew and go,” she says. Swan Lake photo by Santiago Barreiro Ravera. Others by Eduardo Patino.